Where will your muse guide you? 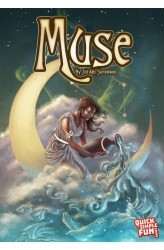 Lead your teammates to inspiration using cryptic clues and surreal imagery in Muse, a beautiful party game with over one hundred fully-illustrated cards. Play cooperatively at lower player counts, or divide into teams for competitive play with four or more at the table — the game is played the same either way! As a muse, you need to be creative to give the right clue within the constraints of the inspiration card you've been dealt, hoping to lead your team to their masterpiece. As artists, you work alongside one another to decipher that clue, and correctly choose the piece of art from the line-up. Challenge your creativity, listen closely, and let your muse guide you to your masterpiece! https://www.youtube.com/watch?v=t_OG7xH1xHw .. 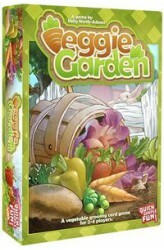 In Veggie Garden, 2-4 players are trying to grow the best vegetables in a short amount of time — but it won't be easy as other players will be fighting for space in the garden, and the pesky groundhog and mischievous bunny will be popping up at every turn! https://youtu.be/u1XC-_YFRGA ..